Hide small special gifts inside this hinged porcelain ball ornament. The design of this ornament is a unique way to give out those extra special little gifts. 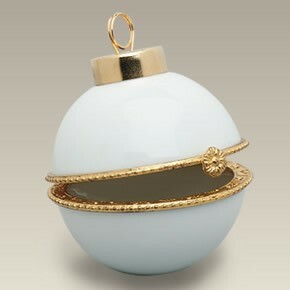 The 2.375" wide ornament has a brass loop and cap for hanging and a matching metal hinge. Made in China. Please note: hinge glues on after decoration and firing.